Historically referred to as a government program for revitalizing undesirable living areas, "homesteading" today has come to mean the pursuit of a self-sufficient lifestyle. Homesteading can include everything from keeping bees, growing vegetables, and composting to installing solar panels, creating a rain barrel, and canning your own food,—plus much more. 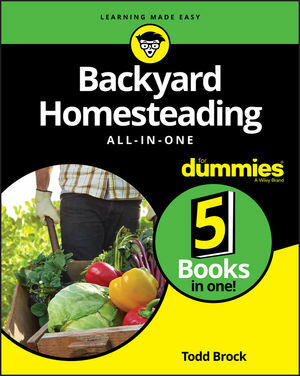 Backyard Homesteading All-in-One For Dummies has a little bit of everything for the homesteader in all of us. It walks you through the basics of creating your own sustainable homestead and offers expert tips and tricks for making it as easy and successful as possible. This book gives you everything you need to embark on your own homesteading adventure. Todd Brock is a television writer and producer whose work includes PBS's Growing a Greener World, DIY Network's Fresh From the Garden, and HGTV's Ground Breakers. He is the coauthor of Building Chicken Coops For Dummies.